Outside the Rat Race: What Do You Care What Other Peope Think? What Do You Care What Other Peope Think? Here is a book I've had sitting in my library for a couple of years: What Do You Care What Other People Think? by Richard Feynman and Ralph Leighton. I read Feynman's first book, Surely You're Joking, Mr. Feynman!, and loved it. He is so smart, yet had a great sense of humor which leads to some pretty entertaining stories. My friend, Brian, who gave both books to me thought I would enjoy them, and I definitely did. We've had our share of crazy adventures, and so we both identified with some of the craziness (imagine two boys in middle school walking around, in the city's underground storm drain pipes, just looking for interesting items. Or attemping to roller blade, for the first time, on a hilly road while sharing one pair of protective gear. Or trying to hide a massive hole in a garden with plywood. Or later using the same plywood to build a fort which we spent a grand total of ONE night in because it was too large to keep.) We're definitely not on the same level as Feynman, but we probably had as much fun. 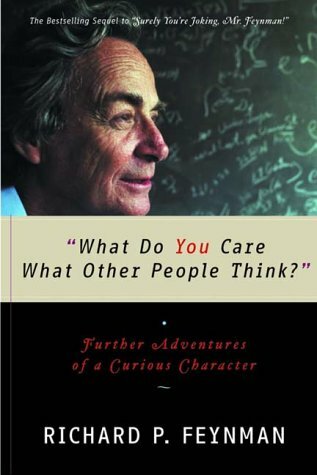 Anyways, the first book focused on Feynman's more crazy stories. He shares lots of his pranks and adventures as a kid, as well as some of his goofy stories while at Los Alamos. The second book is broken into two parts: Stories and letters from when he was older and his experience with the challenger shuttle. For example, one of his interesting stories happened while traveling in Geneva, Switzerland. He was looking for a hotel to stay at for a Physical Society meeting he was attending. Unfortunately all the hotels in the area were booked. So, Feynman decided to stay at a place called Hotel City. It's the type of place that only as a door way on the street and a cloth divider for you personal room. They don't even take reservations! He said he had a blast staying there. They were blown away that a professor would be with them. And every time he got a message, they would race to his room to let him know. As far as he was concerned it was great. Even though the bedspread had a few holes, the place was clean and the people were friendly. The second half of the book focuses on the Challenger explosion. After the Challenger exploded, Feynman was asked to be part of a commission to find out why the accident happened and make recommendations on how to fix it. 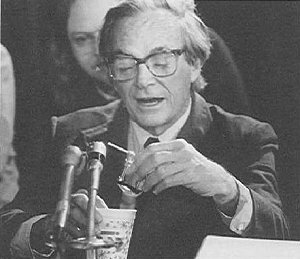 Feynman was the one who broke the story about the O-rings not expanding properly because of the cold weather (the picture is of his experiment at a press conference). He also found many other organizational issues that could potentially lead to all sorts of problems. Throughout the whole story, he talks about how he wandered around just talking to people about what they did. The amazing part to me is how he retained information and was able to put the pieces together. If you're looking for an entertaining biography, this series is a fun read. You'll want to start out with the first book, and it's well worth your time.